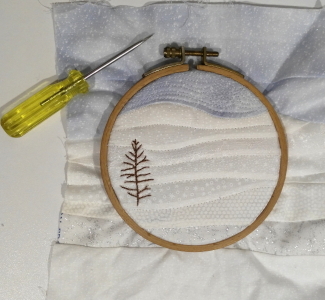 Easy Way to Frame a Block or small quilt » What's Under the Needle? 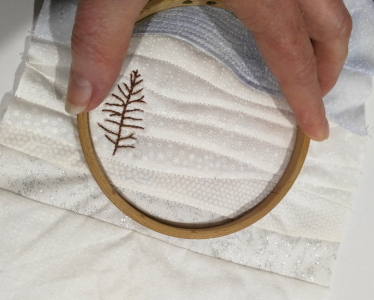 Today I want to share with you how to use an embroidery hoop for framing to finish off a quilt block or small quilt. 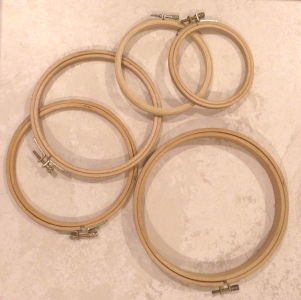 Embroidery hoops come in a variety of shapes, colors, and sizes. I am using a round hoop for this demo but you can also buy oval and square hoops too. 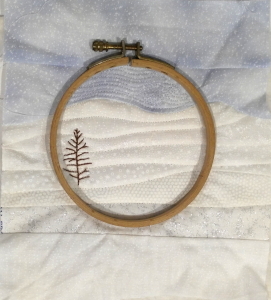 Embroidery hoops are made up of two sections, the inner and the outer hoops. The outer hoop has the screw mechanism. The two sections are what holds the quilt tight for display. Find the center of your quilt and the center of the hoop by measuring the width and height of each. Position the hoop on top so the centers match and check you have at least an excess of 2" of fabric all around the outside of the hoop. If you do not, you will need to add a border or extensions. Once you have your quilt the right size for framing, turn the quilt over to the back and place the smaller hoop on top matching centers. Draw around the outside of the hoop then trim any excess batting back to this line being careful not to cut the quilt top. This will reduce the amount of bulkiness between the two sections of the hoop. Place the inner frame section of the hoop on a flat surface. Center the quilt evenly over the top. 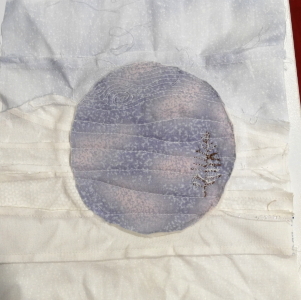 Carefully position the outer hoop on top and press down over the inner hoop keeping the quilt taut. Tighten the screw mechanism. Pull on the excess fabric at the back to make the quilt tighter and then tighten the screw some more making sure to keep the quilt even on the front and wrinkle-free. Keep repeating the process as long as necessary. The quilt should be very tight when finished. Flip the quilt and hoop over. Trim the excess backing fabric leaving a good inch or more. 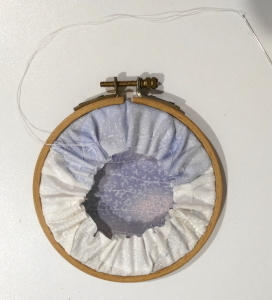 Working from the back with a needle and double thread, make a running stitch about 1/4" from the raw edge. Pull up tightly and adjust the gathers so they sit evenly all around. Before knotting off, check the front and adjust if necessary. You can apply Fray Check to the raw edges to prevent fraying if desired. If you want more ideas for finishing small or large quilts, do check out my "20 Methods to Finish Your Quilts" e-book. I absolutely love the way you have framed the quilts for display. I'm thinking these would be fantastic Christmas gifts!